The Fujifilm 35mm f2 R WR Fujinon lens is a standard focal length prime lens which has an angle of view similar to that of the human eye, and delivers sharp images with rich bokeh. The optical construction of 9 elements in 6 groups ensures high image quality and compact size. 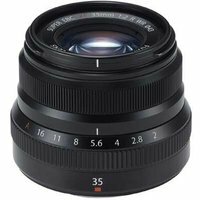 The lightweight Fuji 35mm f2 lens is weather and dust-resistant, and can work in temperatures down to -10°C.